In this lesson, Matt adds to your voicing repertoire while playing the Charleston rhythm. -Play through the "fancy" form of the 12 bar blues in the keys of F and Bb while using the Charleston rhythm. Note: Matt has only provided chord charts for new chord voicings discussed in this lesson. The remaining chord shapes can be found in the lessons listed below. Remember that the low root note of Set 1 and Set 2 voicings can be omitted when comping with the Charleston rhythm. At this time, review all of the Set 3 dominant voicings as well as the minor seventh, ninth, and eleventh voicings. Also, review rootless Set 1 and rootless Set 2 voicings. Matt provides a brief review of rootless chord voicings at 00:58. A review of the chords used in a "fancy" 12 bar blues in the key of F are listed below. Bar 4: optional altered dominant I chord: F7(#9), F7(b9), F7(#11), F7(#5), etc. Bar 8: VI 7 (This chord can be played as an altered dominant if the altered extensions work with the melody.) (options - D7, D9, D13, D7(#9), D7(b9), D7(#11), D7(#5), etc. Bar 10: V7 ((can be played as C7, C9, or C13) an altered V7 chord can be used if it works with the melody. Matt introduces some altered dominant chord voicings that can be used with the Charleston rhythm at 02:03. All of these voicings are transposable. Learn and memorize all of the new voicings that he demonstrates. You can also use rootless versions of the Set 2 altered voicings that you have learned in past lessons when comping with the Charleston rhythm. Matt plays through the first four bars of the form with the Charleston rhythm at 05:05. Practice the "fancy" version of the 12 bar blues progression with the Charleston rhythm. Make sure that your metronome is set to click on beats 2 and 4. Practice in a wide variety of tempo ranges. Begin slow and gradually work your way towards blazing bebop tempos. Chapter 2: (03:29) Playing to the Charleston Rhythm Play several choruses of the "fancy" jazz blues along with Matt in this scene. Use rootless Set 1 and 2 voicings as well as Set 3 voicings. Begin with simplistic voicings and gradually incorporate more colorful voicings during later repetitions of the form. In this lesson set, Matt will teach you everything you need to know to fluently play jazz guitar. Check out this lesson to learn some basic jazz theory & chord voicings. Learn some more advanced chord voicings as well as the Charleston rhythm. Learn a handful of Set II voicings & round out your knowledge of the basic jazz chords. Apply the chords you've learned & experiment with some solo ideas. Learn which scales work with which jazz chord voicings. Matt sheds some light on the circle of fifths. Here's the second installment of Matt's proper practicing lesson. Learn how to avoid carpal tunnel and other hand injuries by using proper technique. Matt Brown teaches the jazz standard "All of Me." Matt Brown explains how to improvise over the changes to "All of Me." 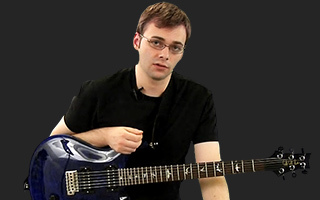 Matt Brown begins talking about solo arrangements in this lesson. He teaches Carcassi's "Estudio No. 1" as an introduction to this concept. Matt Brown returns to his Jazz series with a review lesson. He applies the standard ii V I progression to the circle of fifths. In lesson 14, Matt discusses the turnback progression in the jazz style. Matt brown discusses and demonstrates the set three voicings used in jazz guitar. In this lesson, Matt demonstrates how to practice jazz solo arrangements by taking a look at "Here's That Rainy Day." In lesson 17, Matt reviews and expands on the jazz version of the 12 bar blues form. Matt Brown talks about lead options when playing a blues in B flat major. Matt Brown provides instruction and examples of playing jazz heads in the key of F. Once again, all examples follow the 12 bar blues form. Matt Brown takes another look at blues heads in the key of B flat. In this lesson, he covers a head by Thelonious Monk. Matt Brown takes a look at a solo arrangement and provides thoughts and tools necessary to complete this type of guitar playing. Matt Brown starts breaking down the rhythmic tendencies and patterns to the Brazilian Bossa Nova style of playing. In lesson 24 of his Jazz series, Matt takes a look at the melody to Blue Bossa. Matt Brown takes a look at the available chord voicings for Blue Bossa.